If I have been using Sure Step for years on my decks do I need to do a two step cleaning with Wash and Scrub each year? My decks are covered for 6 months of the year. It’s a judgment call. 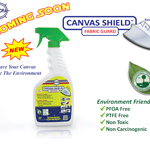 The cleaner you get the surface before you reapply the Sure Step, the brighter it will appear, the better it will bond and the longer it will last., however a lot of sailors just wash the deck well with Boat Clean Plus and reapply the Sure Step. They seem to be happy with the results. If the decks are clean and there are no scuff marks or stains you can get away with this because the previous coats of Sure Step will have sealed the pores in the gelcoat. Sealing the pores is very important as that prevents bacteria, dirt and stains from lodging in these microscopic crevices. Open and contaminated pores in polyester gelcoat has been proven to induce the generation of free radicals which, in combination with UV, accelerates the degradation of the gelcoat polymers. The reason for using Boat Clean Plus and Boat Scrub is to deep clean the pores as well as to deoxidize, clean and brighten the surface. On my boat, I always use both products once each year. 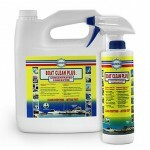 When the deck is wet with Boat Clean Plus and water, I add some Boat Scrub, scrub it quickly again and rinse it clean. It doesn’t add much time and I always get perfect results. My decks are bright white and I like to keep them that way. If you take shortcuts with cleaning then over time the white takes on a gray or yellow tinge, which I don’t care for. Perhaps I’m just too fussy.